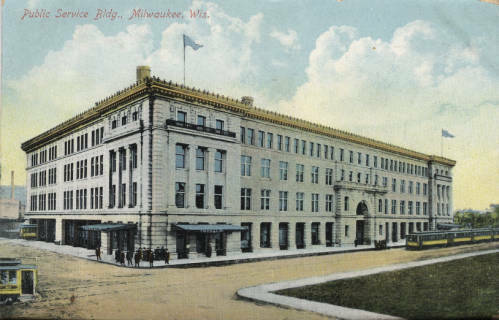 The Public Service Building, designed by Herman J. Esser, opened in 1905 in order to coordinate Milwaukee’s transportation and energy provisions. The Beaux-Arts Neoclassical structure functioned as the MILWAUKEE ELECTRIC RAILWAY AND LIGHT COMPANY’S main office, central terminal, and training facility. The company’s horsecar and, later, electric streetcar network served Milwaukee’s neighborhoods and suburbs until the 1950s. The rectangular building occupies the whole city block between Third and Second Streets on Michigan Street and features distinctive ornamentation on all four stories of its limestone facade. The structure’s interior combines a marble walled lobby, oval-shaped stained glass skylights, and a copper relief of a buzzing beehive meant to symbolize the building’s relentless activity. The building currently serves as We Energies’ corporate headquarters. ^ Randy Garber, ed., Built in Milwaukee: An Architectural View of the City (Milwaukee, WI: City of Milwaukee, Henry W. Maier, Mayor, and the Dept. of City Development, William Ryan Drew, Commissioner, 1981), 84. ^ Joseph J. Korom, Look Up, Milwaukee: Eastside/Westside, All Around Downtown: A Descriptive and Pictorial Display of Selected Architectural Scenery (Milwaukee, WI: Franklin Publishers, 1979), 95. ^ “National or State Registers Record: 231 W. Michigan St.,” Wisconsin Historical Society, Accessed July 7, 2016. Garber, Randy, ed. Built in Milwaukee: An Architectural View of the City. Milwaukee, WI: City of Milwaukee, Henry W. Maier, Mayor, and the Dept. of City Development, William Ryan Drew, Commissioner, 1981. Korom, Joseph J. Look Up, Milwaukee: Eastside/Westside, All Around Downtown : A Descriptive and Pictorial Display of Selected Architectural Scenery. Milwaukee, WI: Franklin Publishers, 1979. “National or State Registers Record: 231 W. Michigan St.” Wisconsin Historical Society. Accessed July 7, 2016.